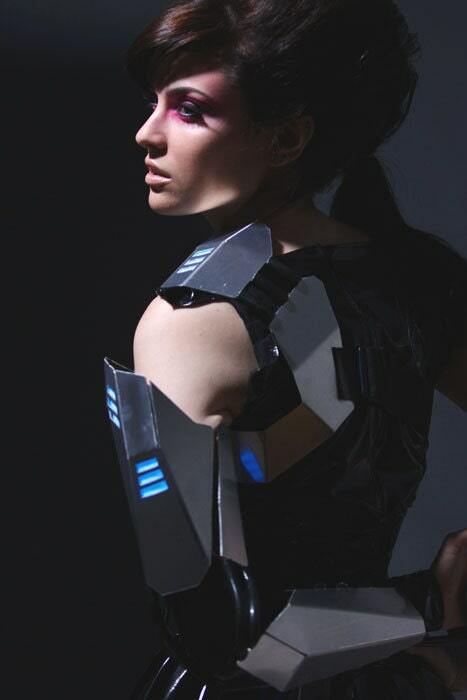 Bionic Concepts - Cyber Gladiator Armour with Blue Flat Panel Lights. Durable and functional arm and shoulder armor with integrated flat panel lights in your choice of color. Protects without restricting range of motion. Secured by a 2 inch wide black adjustable strap across the chest holding the battery pack and light activation button. 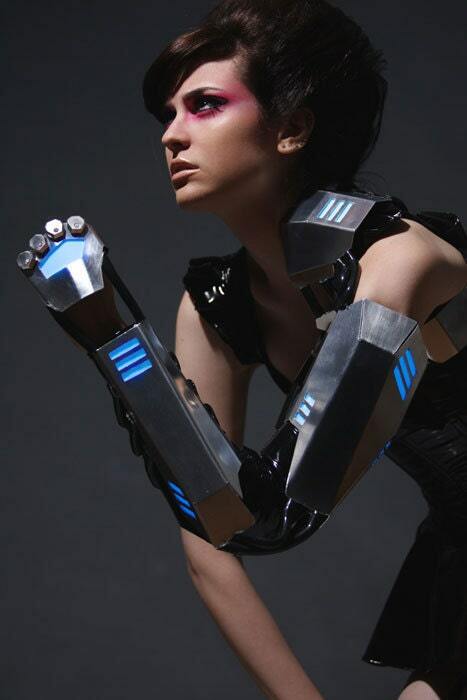 Black latex tubing keeps armor segments together and allows for smooth bending of joints. Inside is lined with black fabric to keep the armor comfortable. Takes one 9 volt battery. Blue and white lights are the brightest, red and purple are the least. More pictures on our home website. Adjustable flashing and dimming function on the new inverter battery packs. Armor is built to average arm dimensions. Choose X-LARGE, LARGE, MEDIUM, SMALL or X-SMALL. Use your T-Shirt size to decide which size to order. Fits both male and female. Adjustable around the forearm and bicep. If you are concerned about the fit please include a note specifying your height and weight to confirm fit. Standard Construction Time is 2 Weeks. Delivery in a week or so.